Over the last several versions of Max, the Jitter landscape has changed significantly. Gone are the days of compressing your video material to 320x240 MJPEG to squeeze out 30 frames per second. Texture processing, faster GPU’s, the proliferation of HD video devices, and inter-application video solutions like Syphon and Spout have redefined what is possible with real-time video. Max offers many ways to interact with these newer frontiers, but with so many options it can be hard to know where to focus. For established Max users it can be challenging to break old habits and for new users it can be daunting to know where to begin. For the next few months we will be highlighting the video side of things and providing some different roadmaps for how to navigate the Jitter landscape. To kick things off, we decided to give an overview of some of the existing resources that can help you dive deeper into Jitter. From built-in tutorials and examples, to newsletter articles, user-groups, video tutorial series’, online content creators, and online courses, there is a wealth of material for honing your skills. Video and Graphics Programming Tutorials. This core skills course will get you building projects with Jitter right away, the right way. Learn about texture processing and make it part of your practice from the start. Working with OpenGL. This topic covers everything from building a basic render context, to building complex OpenGL scenes, to working with jit.gl.pix to create custom shaders. Advanced Jitter Topics. Learn about things like special messages to control jitter, different video engines, and how to layer in OpenGL. 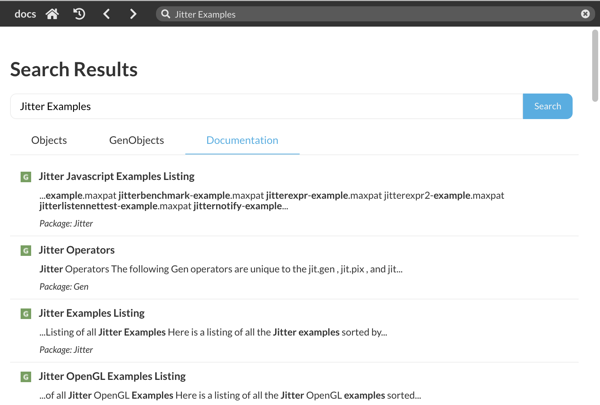 Jitter Object Functional Listing. A list of all jitter objects by function. Jitter Examples Listing. 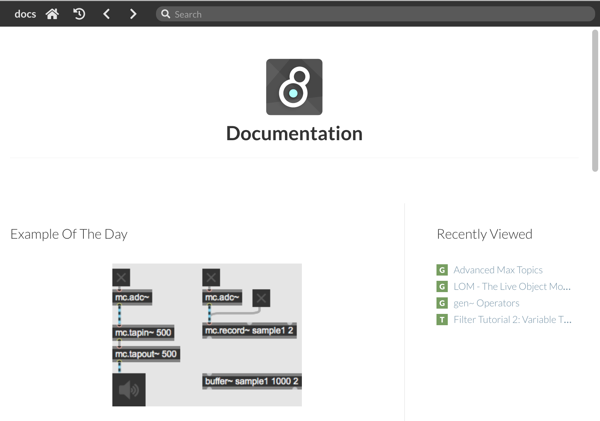 This guide, available in the documentation browser, gives quick access to most of the jitter example patches included with Max 8. The zgen section is a great place to see examples of jit.gen and jit.gl.pix. You can also find this content in the File Browser under the Cycling ‘74 section. cv.jit: A collection of external objects for computer vision applications originally authored by Jean-Marc Pelletier. Ease: Easing functions in Max for audio, visuals, and automation. Hap: Hap video engine for using VIDVOX’s open source Hap codec for highly efficient realtime video playback. Jitter Recipes: A selection of Jitter examples including video synths, OpenGL graphics, video feedback, live visuals and more. This growing collection by Andrew Benson is now available as a package in the Package Manager. 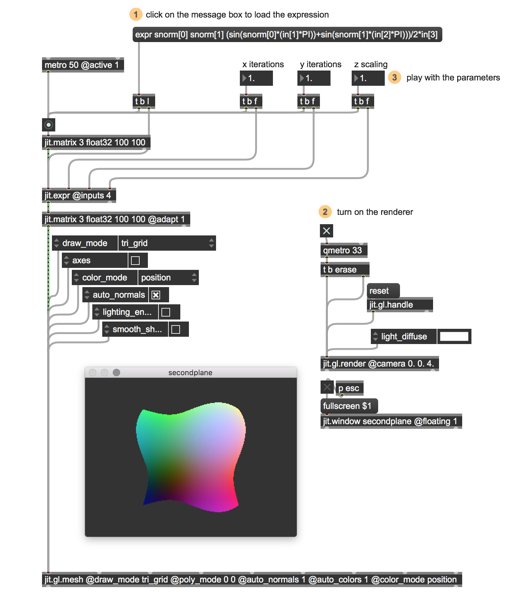 jit.mo: A series of objects for motion graphics, optimized for use with jit.gl.multiple and jit.gl.mesh. The jit.mo objects synchronize with jit.world contexts to provide smooth time-varying animation functions. Spout: (Windows only) Jitter tools for sending and receiving inter-application video textures with Spout enabled applications. Syphon: (Mac only) Jitter tools for sending and receiving inter-application video textures with Syphon enabled applications. VIZZIE: The VIZZIE package has grown a lot with the release of Max 8. VIZZIE version 2 now utilizes texture processing to leverage the power of your graphics card, letting you quickly create video processing chains capable of manipulating multiple streams of HD video. It can even be incorporated into larger patchers with traditional Jitter objects! Built into Max, you can access it from the VIZZIE icon in the left sidebar. VR: Graham Wakefields library for working with Virtual Reality headsets. Vsynth: Kevin Kripper's gen-based modular video synthesis system. Xray: A collection of Jitter utilities by Wesley Smith for working with data, geometry and video. The Cycling ‘74 website has a wealth of information from tutorials, to forum threads, to newsletter articles, user created content, tools and projects. Some of these are simple examples of how to make use of new features while others aim to introduce us to whole fields, like how to write a shader or make sense of jit.gl.pix. Here are some key posts that we think every Jitter use should know about. Max wouldn’t be what it is without our community and incredible user base. Many of our users have dedicated themselves to making Max more learnable and accessible. Here are a few examples that are worth spending some time with. Shaders in Jitter, and other tutorials by Peter Elsea. Intro to jit.gl.multiple, by Claire Steger. Federico Foderaro Tutorials for learning about shaders. Delicious Max Tutorials - Our own Sam Tarakajian guides us through many corners of Max. Massively Max Tutorials - Max video tutorials on a wide range of topics by Programming For People. Selfie Sunday Tutorials - Video processing tutorials by Chris Vik. Create Sounds with Jitter Tutorials - Tutorials on using jitter to make audio by Znibble~. John Jannone Max/Jitter Tutorials - Various tutorials on a range of Jitter and Max topics. 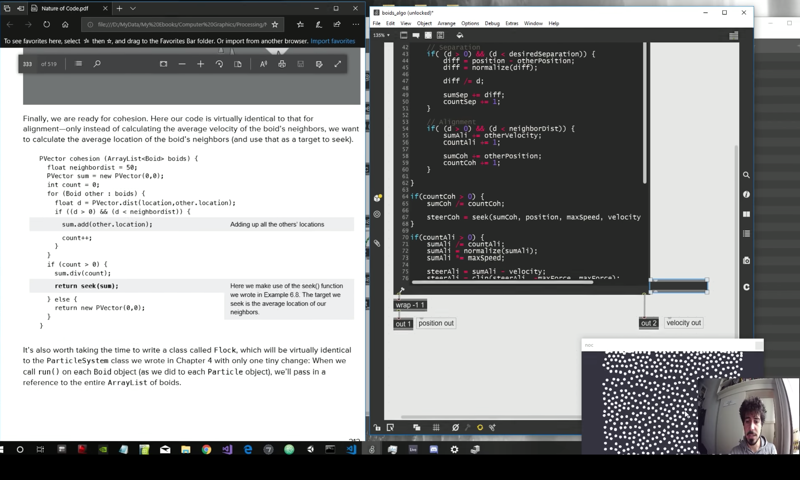 Nothing beats social media for quick turnaround on "hot topics"
In addition to a world of Jitter resources that are free to you, some members of the Max community have created resources that you'll need to pay for - either through patronage-based Patreon channels, or online courses. We hope that this gives everyone some new places to look or reminds them of valuable resources they might have forgotten. We also realize that this in no way encompasses all the resources that are out there, so if you have a favorite Jitter resource, whether it’s a youtube channel or a specific tutorial, please post it below so we can collectively ease access to the materials and to the process of learning and using Jitter! Great resource page. Thanks for organizing. Thanks for this! I now have my summer learning laid out for me! Just what I needed to dive back in! See you at Expo '74!